Hanover Engineering was retained by Mount Joy Township Authority to prepare construction plans and specifications for the replacement of gravity sanitary sewer lines and a parallel sanitary force main along a portion of Hershey Road (SR 743) at the Route 283 Interchange in Mount Joy Township. The project consisted of the installation of 1,300 feet of 12-inch PVC gravity sewer line, 670 feet of 6-inch PVC force main, and a flow meter and vault on the force main near an existing pumping station. In addition, new casing pipes were installed at each of the four slip ramps due to the unknown condition of the existing 30-year old steel casing pipes. The project entailed unique design and construction aspects, such as the boring under four slip lanes of the interchange and the crossing of a high-pressure petroleum transmission pipeline. These features of the project required careful coordination for the design, permitting and construction of the sewer lines with the facility owners and/or appropriate agencies. 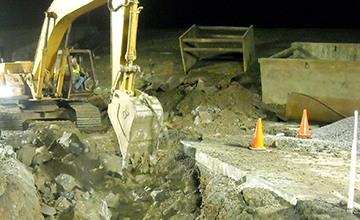 Also an extensive amount of work had to be completed at night due to the PennDOT lane closure restrictions on SR 743. The new sewer lines were constructed in the same trenches as the existing pipe, when possible, due to the presence of rock in the project area. This approach required careful coordination of bypass pumping, but minimized rock excavation and reduced the cost of the project. The project was initiated after two major force main failures occurred in the area of the interchange. During the repairs, it was discovered the ductile iron gravity line and force main were severely corroded. Design for the replacement work was completed on an accelerated schedule, and HDPE and PVC pipe were used for the replacement pipe to avoid future corrosion problems.